Madeleine Ackels studied Elementary Education at Spring Hill College in Mobile, Alabama. This year, Ms. Ackels will be teaching Micronesian History I, Sophomore Literature, and Sacred Scripture. She will also be leading the gardening club as well as assisting the girls’ volleyball team. Ms. Ackels is from Dallas, Texas, and enjoys saying things like, “y’all”. In her free time, she enjoys riding her bike, hiking, and tasting new, local foods. Nicholas Endo comes to Yap by way of New York, where he recently graduated from Fordham University at Lincoln Center. While at Fordham, he studied International Political Economy, Theology, and Spanish. Here at YCHS, Mr. Endo will be teaching Jesus of History, Christ of Faith to the sophomores, Morality to the juniors, and assisting with college counseling for the seniors. Additionally, he will be leading the choir and helping out with First Fridays. In his free time, Mr. Endo enjoys running, learning the ukulele, and making butter. Michael Lamanna, S.J. is originally from Albany, NY, and joined the Society of Jesus (Jesuits) in 2011. He graduated from Syracuse University in 2009 with degrees in geography and economics, and after entering the Jesuits, he earned a Masters in Social Philosophy from Loyola University Chicago. At YCHS, Mr. Lamanna will be teaching math to juniors, world history to seniors, and religion to the first-year students. He has become very interested in planting vegetables at the Jesuit community, and plays piano. While he misses the variety of food in Chicago, he is greatly enjoying the fish and fruit on Yap. Ms. Abby MacLean will be joining the YCHS faculty this new school year from Boston, Massachusetts. Ms. MacLean is a graduate of Boston College's Lynch School of Education with a degree in applied psychology and human development. Ms. MacLean will be teaching sophomore geometry, and English Language Arts for the juniors and seniors. Ms. MacLean is also excited to lead the drama/improv group as well as be the assistant coach for the boy's volleyball team. She is thrilled to be a member of the YCHS community as well as a member of the larger Yap community. Fr. Jack Mattimore, S.J. is the new director of Yap Catholic High School, replacing Fr. Michael Corcoran, a friend of his since they were boys in grade school and high school. Fr. Mattimore is a graduate of Fordham University, Regis College, University of Toronto, and Columbia Teachers College. He has taught English and Religion and been an administrator in several high schools in the United States. At YCHS, he will be in charge of long-term planning, finances, fund-raising as well as performing other duties. The best part of his day is teaching English Language Arts to the sophomore class. Sarah Penalosa is a Bay Area (California) native who attended Seattle University. She graduated with a degree in Humanities for Teaching this past year. Ms. Penalosa is excited to be teaching freshman Algebra, sophomore Micronesian History, and junior U.S. History. She will also be coordinating Yearbook and Journalism with Ms. Gail. A fun fact about her is that one of her favorite ice cream flavors is corn n' cheese! Mr. Michael Lamanna, S.J., Fr. Jack Mattimore, S.J., and Fr. John Mulreany, S.J. moments after Fr. 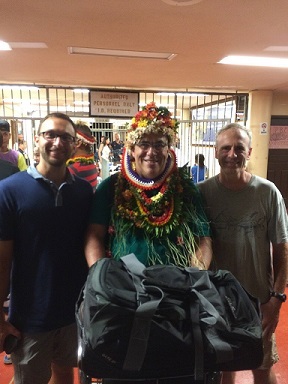 Mattimore's arrival on Yap. Principal, Mr. Michael Wiencek, welcomes new Director, Fr. Jack Mattimore, S.J. 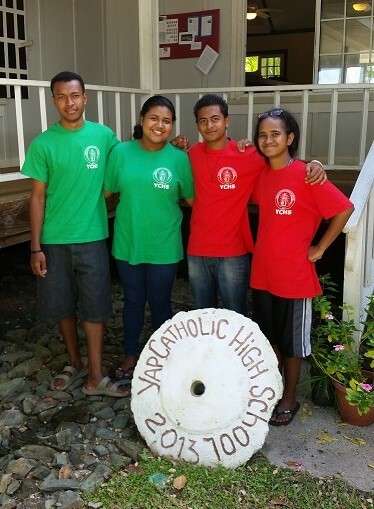 Yap Catholic High School’s Summer Session offers a program for all students to continue their academic studies throughout the month of July, while also incorporating numerous activities in the afternoons for the students to enjoy. Incoming freshmen begin their transition to life at YCHS while taking introductory Math and English courses. Sophomores focus on continuing to build their Algebra skills and explore different projects involving a novel. Juniors and seniors work on computer skills while also preparing for the SAT and working on college essays. This year, four recent alumni returned to Yap for the summer to become the founding members of the YCHS Alumni Volunteer Corps. These four alumni are all currently enrolled at colleges in the United States and assisted with the summer session. In the mornings, they helped in the classroom as teacher aides as well as proctors for the daily silent reading period. In the afternoons, they each had specific activities that they were in charge of working with a teacher to coordinate. They also ran various ice breaker and team building activities for the students. Bradley Kogotmay worked with the English classes as well as collaborated with YSHPO as a group of students explored their culture and worked towards creating a cultural identity video for YCHS. He is currently pursuing a degree in the field of anthropology at Portland Community College. Domclancy “Jun” Tiliwebug assisted with the Math classes and also helped to coach the volleyball club. He is a Gates Millennium Scholar and attends the University of Portland where he is studying electrical engineering. April Laabrug helped with the English classes and assisted in directing the drama club as they prepared their own play acting out the life of St. Ignatius Loyola. She is studying Secondary Education with a focus in English Literature at The University of Scranton. 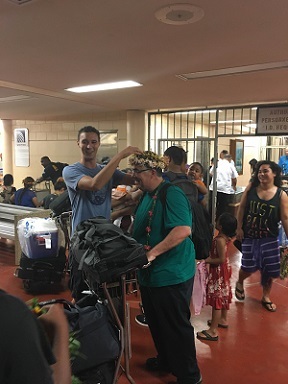 Jamilyn “Jamie” Mooteb also worked with the Math classes and guided students in preparing science projects for the Science Fair at the College of Micronesia: Yap Campus. She attends Saint Joseph University where she is a physics major. All four alumni did an incredible job and they were fantastic role models for the current students. YCHS looks forward to continuing the tradition of alumni returning to help with the summer session when they are visiting Yap during their summer breaks. 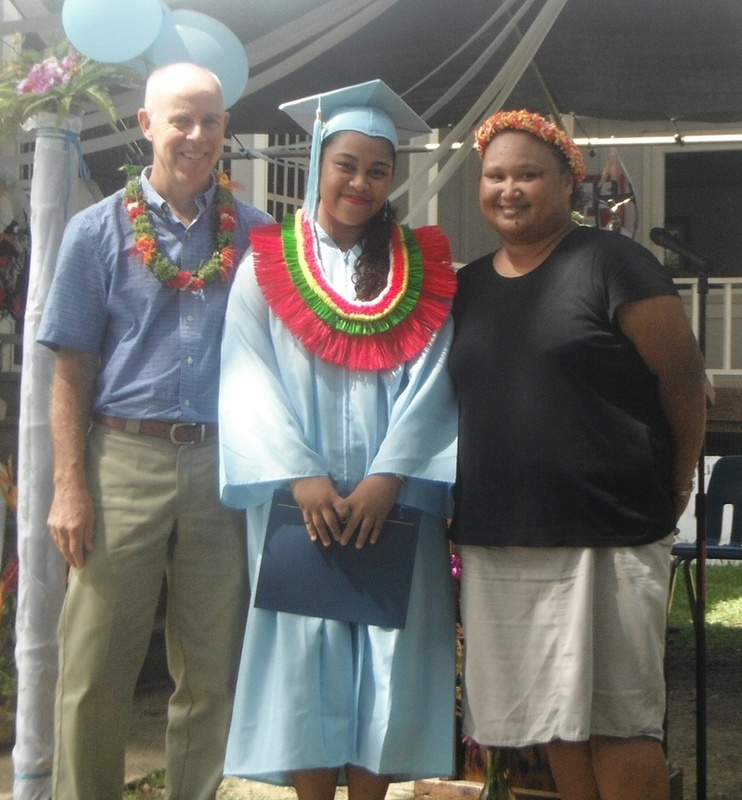 Yap Catholic High School celebrated its third commencement on Saturday afternoon on the YCHS campus. Sixteen members of the class of 2016 received their high school diplomas from Mr. Nick Figir, chair of the YCHS Board of Directors. Selena Tafnag, class salutatorian, welcomed all the guests to the graduation ceremony. Kobe Sacres, class valedictorian, then addressed the assembled crowd and the class of 2016. Kobe spoke of the class's many shared experiences and reminded everyone that they are a class of many "firsts." 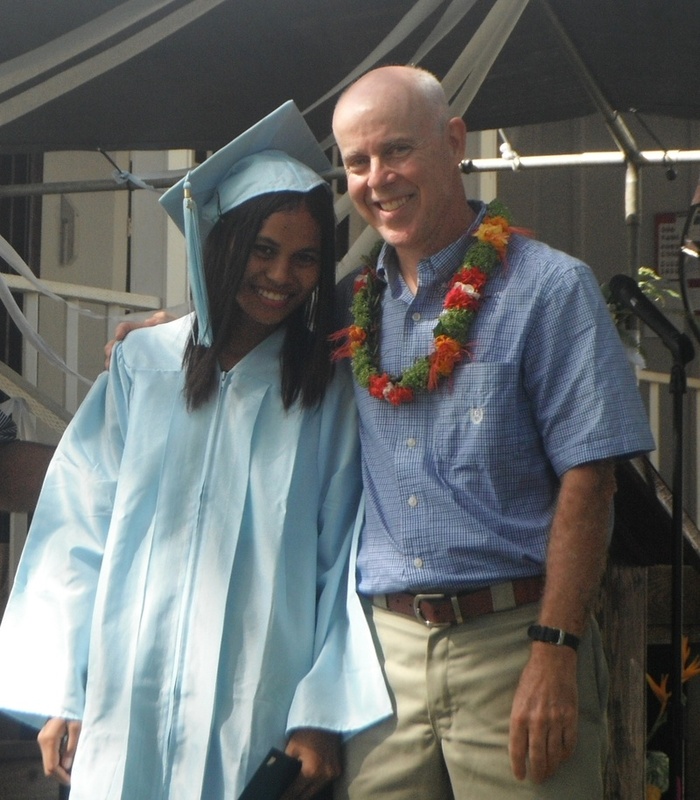 Don Evans (Director of the Yap Visitors Bureau) delivered an inspiring commencement address. He situated this historical class of 2016 into the larger historical picture of Catholic education on Yap, from the time of the original Spanish Cappuchins to the more recent Maryknoll Sister Joanne McMahon. Mr. Michael Wiencek (Director of College Counseling) gave an overview of the college plans for the new graduates. 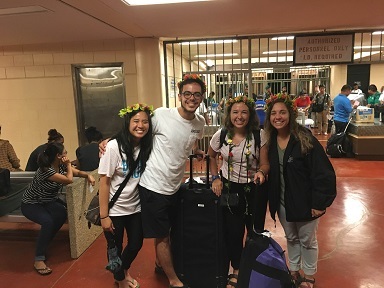 All sixteen will travel off-island for college: two will head for Guam, two will travel to the Philippines, two more will study in Hawaii, and ten will attend college on the mainland U.S. Of those ten, seven will study at Jesuit colleges. The class of 2016 was congratulated for having no absences for their entire year. Seven of the graduates received the "Kevin and Kobe Sacres Attendance Award," named for two bothers (Kevin '15) and (Kobe ('16) who were never late or absent in four years. Along with Kobe, the six others with Perfect Attedance were Jancely Harongreg, Marcy Kentun, Demetria Mtag, Selena Tafnag, Annalyn Tareg, and Jersaleen Waayan. Three major awards were presented at the graduation ceremony. The Pope Francis Service Award is presented to the member of the senior class who has shown, by his or her own example, the importance of "using our gifts in the service of God and others." The winner of the 2016 Pope Francis Service Award was Annalyn Tareg. The Mission Statement of YCHS reads: Grounded in the Catholic faith, Yap Catholic High School strives to educate students to achieve academic excellence, appreciate their culture, be good stewards of the environment, and live their faith in the service of God and others. The Living the Mission Award is presented to the member of the senior class who best lives out the mission of our school. This award is voted on by the members of the senior class. The 2016 Living the Mission Award was presented to Rheena Yirimyad. The Father Walter Ciszek, S.J. Award is named for an American Jesuit priest who spent over twenty years as a prisoner in Russian labor camps before, during, and after World War Two. Despite the grueling work, terrible living quarters, and limited food, Father Ciszek continued to minister as a priest for his fellow prisoners – hearing confessions, giving spiritual advice, and celebrating Mass in secret. Despite facing tremendous obstacles, he refused to give up. This award is presented to the member of the senior class who faced significant obstacles on the road to graduation day, but refused to give up. The 2016 Father Walter Ciszek, S.J. Award was presented to Ley Pilyan. These three award winners are pictured below. To view pictures of all the graduates and the graduation ceremony, click on the "Photo Gallery" link above. 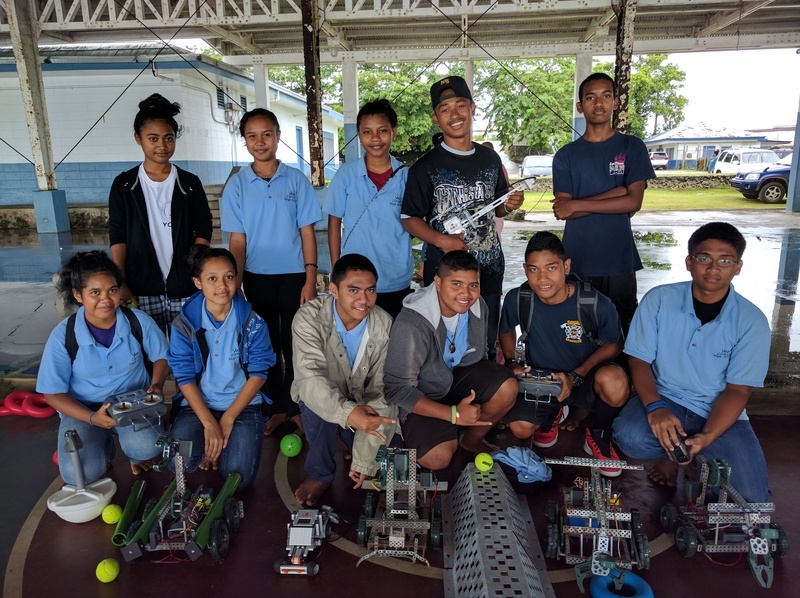 On Tuesday, May 24th, Yap Catholic High School hosted the annual “Yap Robo-Day” thanks to donations from the Habele Foundation. “Yap Robo-Day” was held at the Community Center from 11:00 AM – 1:00 PM. Despite the torrential downpour, the twenty-five students in the club still carried on with their robotics demonstrations for more than 100 visitors to the event. The students made repairs and improvements to their robots and even taught some visitors how to drive and operate the different robots. The Robotics Club had started working on their robots in January of this year under the guidance of their faculty moderators, Mr. Michael Wiencek and Ms. Devi Gopal. This year, two senior students, Armhel Pigao and Kobe Sacres, served in the leadership roles of project contractors for the club. YCHS produced a record number of four different robots, as well as a few side projects as well including a miniature race car and an electric guitar made out of legos. This STEM oriented activity gives students the opportunity to explore their interest in possible science and engineering related careers in the future, while also developing their collaboration and leadership skills. The Yap Catholic High School community also raised $390 through their fundraising food and drink sale at the event. Thank-you to all who came out to support the Yap Robo-Day event! The Gates Millennium Scholars Program is in its final year of awarding good-through-graduation scholarships that cover the unmet financial need of students heading to college in the United States. This year, over 56,000 students in the United States and the Pacific Region applied for this prestigious scholarship – only 1,000 students were selected as recipients of the award. 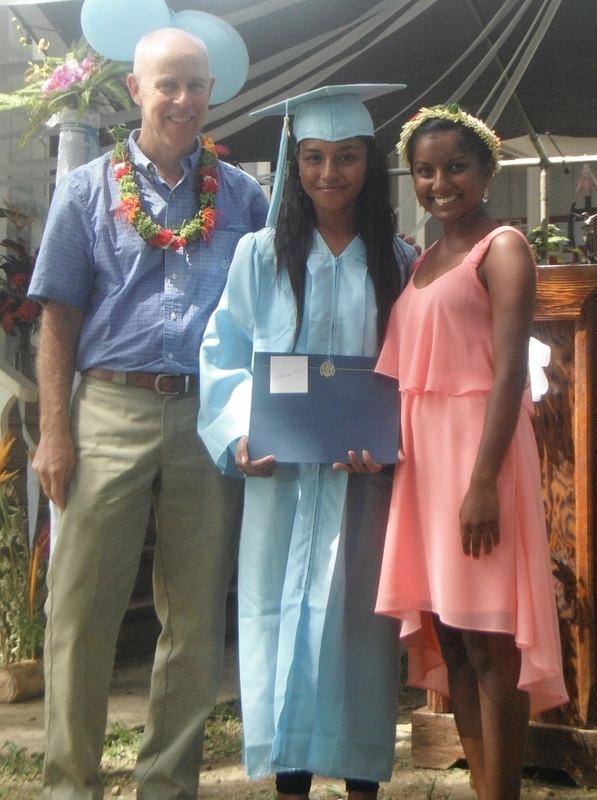 Selena Tafnag, a member of the Yap Catholic High School Class of 2016, was awarded the Gates Millennium Scholarship this year. Over her four years at YCHS, Selena has achieved a 94% unweighted average. Selena has consistently earned perfect attendance awards - she was not absent for even a single day throughout her four years at YCHS. She has been an active member of the volleyball team, the gardening club, the debate team, and the First Friday Youth Planning Group. This year, Selena has also served as the editor of the school’s yearbook. In the fall, Selena will be attending Creighton University to study Health Administration and Public Health. Creighton University is a Catholic and Jesuit university in Omaha, Nebraska. She hopes to continue on after receiving her Bachelor’s degree to earn her Master’s degree, which could also be funded through the Gates scholarship program. 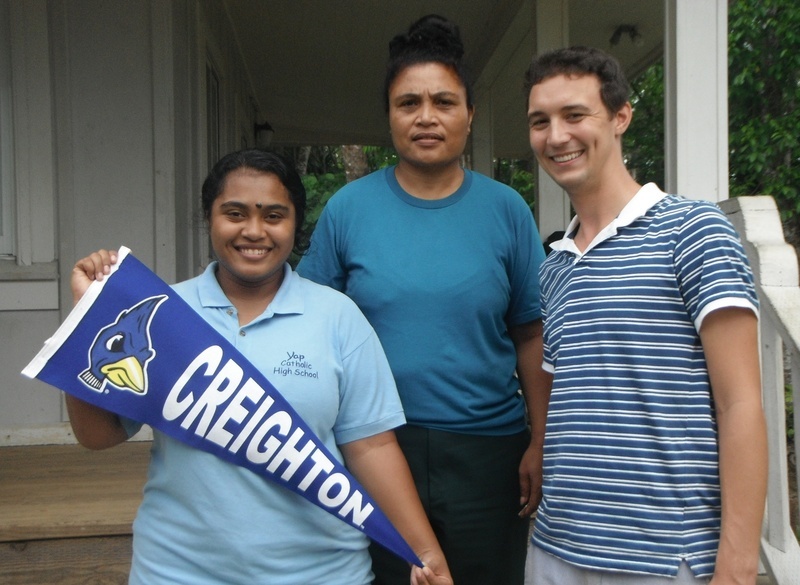 We wish Selena the best of luck as she continues her educational journey at Creighton! Pictured below are Selena Tafnag, her mother – Antonia Tafnag, and Mr. Michael Wiencek. Hundreds of visitors, including YCHS students and their families, Board members, and friends of the school gathered on campus for a potluck dinner and Mass of Thanksgiving for Father Corcoran. Corcoran, the founding Principal and Director of YCHS, is completing five years of service at the school. He will leave this summer to begin a new assignment in the U.S. In his homily at Mass, Father Mulreany (who arrived five years ago with Corcoran) compared how the disciples may have felt when they realized Jesus would be leaving them and how many at YCHS may feel about Corcoran's departure. "No one should be worried," Mulreany reassured the congregation. "Jesus told the disciples that the Father would send the Holy Spirit to remind them of all He taught them. The Holy Spirit, which gave birth to this school, will continue to remind us of all that Father Corcoran has taught us." Mulreany then mentioned three of the important lessons Corcoran brought to YCHS: 1. Be at school and on time every day. 2. Be a reader. 3. Do what's right, not what's easy. Mulreany finished by thanking Corcoran "for bringing out the best in all of us." During his remarks after Mass, Corcoran thanked all those who have helped make YCHS a success. To view pictures of ther Mass and dinner, click on the Photo Gallery link above. The entire Yap Catholic High School community would like to thank the Yap State Public Service Corporation (YSPSC) for their recent pro bono work on the YCHS campus. To remove five very large fir trees that were dangerously close to the Administration Building, YSPSC workers brought in their specialized equipment and, over the course of two days, were able to safely cut down the trees. "We are extremely grateful for the YSPSC work," said Father Corcoran, school Director. "Those large trees were a constant worry. If they came down during a typhoon, they would have caused tremendous damage to our building. YSPSC has been very helpful at every stage of our new campus construction." Pictured below is the new view of the YCHS Administration Building. At the recent Third Quarter Honors Assembly, YCHS Principal Father Corcoran announced that the student body set an all-time school record for attendance. Sixty-four YCHS students (90% of the school) were at school and on time every day during the third quarter. There was only one student absence for the entire quarter. Academic awards were also preseneted at the Assembly. Thirty-six students earned Second Honors by achieving grades of 80% or higher in all their classes. Twenty four students (including ten freshmen) received First Honors (grades of 90% or higher in all classes). The freshmen who achieved First Honors were Johanne Arao, Roselyn Beltran, Jennaia Chonmon, CeeCee Keppin, Marcia Matnan, Julia Ranganbay, Ashley Rapgeg, Tristan Ruway, Jayvie Taruweliut, and Nicholas Untun. Upperclass First Honors students were Hans Banua, Giselle Giyetinag, Zoya-Marie Sigeyog, Aaron Yow, Bryan Bomtam, Jalani Gootinmutnguy, Shawn Libyan, Natasha Loochaz, Blossom Moofal, Rozeanne Ruema, Jancely Harongreg, Marcy Kentun, Armhel Pigao, and Kobe Sacres. All First Honors students are pictured below. Congratulations to all award winners! YCHS has named a new Director of the school, Father Jack Mattimore, S.J. and a new Principal, Mr. Michael Wiencek. Fr. Mattimore will arrive on Yap and begin work in mid-July. Mr. Wiencek will take over as Principal in June. Father Mattimore, a graduate of Canisius High School in Buffalo, NY, holds a Bachelor’s Degree from Fordham University, STB and MDiv degrees from Regis College, a ThM degree from the University of Toronto, an MA degree from Columbia University, and a Professional Diploma in Administration from Fordham University. Fr. Mattimore has worked at four different Jesuit high schools in the U.S. -- Canisius, Fordham Prep, Xavier, and Cristo Rey Baltimore – as well as Nativity Mission Center, a Jesuit middle school. He has been a Religion teacher, English teacher, Assistant Headmaster, and Principal. Mr. Wiencek, a graduate of the University of Scranton, served for two years as a volunteer teacher at YCHS before going back to the US to work at Cristo Rey Jesuit High School in Philadelphia. Returning to Yap this year, Mr. Wiencek became the school's Director of College Counseling and Assistant Principal. He is also the school's Chemistry teacher. When asked about the new Principal, Fr. Corcoran said, "Mr. Wiencek is a fantastic choice. He's well-known and greatly respected at the school and in the wider community. His natural leadership skills will be critical as YCHS continues to strive for excellence." Father Corcoran, YCHS Director and Principal since the school was founded in 2011, will return to the US this summer to begin a new teaching assignment at Cristo Rey Jesuit High School in Baltimore, Maryland. 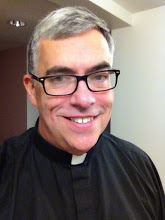 Pictured below is the new Director, Father Mattimore, S.J. Yap Catholic High School will hold an Open House on Saturday, February 13th from 10 am until 12 noon. The Open House is for 7th and 8th grade students (and their families) who might be interested in applying to the school and all others who might like to learn more about the school or simply see the YCHS campus, including the recently completed Loyola Chapel. Applications for the new freshman class will be available at the Open House. Applications will also be available during the week following the Open House at the St. Mary's Vicariate Office. YCHS does consider transfer applications on a case-by-case basis. Interested families should call the school or set up an interview at the Open House. Teachers, students, and parents will be available to answer questions. Come out and see Yap's award-winning school!